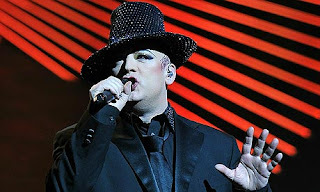 WAIST HIGH: Boy George Says Culture Club Will Reunite In 2012. Boy George Says Culture Club Will Reunite In 2012. Boy George confirmed yesterday that Culture Club will reform next year for their 30th anniversary with a new album and a world tour. From guardian.co.uk: "We are getting back together," Boy George, real name George O'Dowd, told BBC Breakfast. Although the singer is releasing a solo album next week, he was asked about a reunion on behalf of DJ Mark Ronson, a Culture Club fan. "Next year," George said. "This year I'm doing the Here and Now tour...on my own, but it's kind of a precursor for what I'm doing with Culture Club in 2012."